Will Doolan is a caulker and adventurer who has travelled to the Americas with the infamous Sir Francis Drake. There they raid and pillage the Spanish galleons that transport gold and silver back to Spain. But Will is deeply troubled and rents an attic room from a merchant, Nicholas Cooksley, from where he plot his return to the lands where he lost his honour. But Will has fallen for the beautiful Lady Ellyn, Mr Cooksley's daughter and so his conscience is troubled even further as he knows if he goes with Drake then his chance of winning Ellyn's hand will disappear. Will convinces Cooksley to part-subsidise Drake's adventure, but shockingly the gout-riddled, wheezing merchant insists on making the voyage with them. Ellyn is horrified when she learns of her father's intentions, and when Will dares to show her his true feelings, she is desperate not to lose the two most important men in her life. Ellyn makes a rash decision that endangers everything she holds dear and threatens the life of not only those she loves, but the fleet of ships and even the famous adventurer himself. 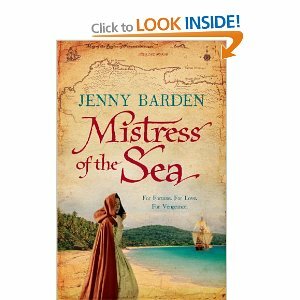 Mistress of the Sea is a real, old fashioned swash-buckler of a novel that will appeal to all readers. Its is a story that harks back to the very start of the Golden Age of Discovery and the author has weaved a marvellous work of fiction around a very well-known historical figure and his “antics”. Sir Francis Drake was both hero and villain to England and Jenny Barden creates characters that explore the most pertinent questions about his intentions as well as crafting a story that is strong and set apart from Drake’s own. It is, essentially, a love story. But not only about the love between hero & heroine but the love of family, the love of humanity and, ultimately, the realisation and acceptance of the price each of us must pay to find happiness. This is a rip-roaring story where heroes are crafted in the spirit of Errol Flynn & the heroine could be Olivia de Haviland. Jenny Barden writes scenes that you picture in your mind just like the films of yore where dashing heroes fight with dark, brooding enemies in order to win the heart of the maiden in distress. All in all this is a very good debut novel by an author who has a talent for creating exciting, vibrant stories. I give MISTRESS OF THE SEA 5 Crosses! Buy Mistress of the Sea from my dedicated Amazon aStore! I reviewed Mistress of the Sea on my blog this past week, too. I also enjoyed it. Fun! Sounds fantastic! I love anything privateer! Thank you for the review Stuart. It's on my TBR at the moment!